Come any closer and you'll get a taste of these spines! In the last episode of Bug of the Week we met the noisome brown marmorated stink bug and learned of its impending plan for home invasions over the next several weeks. This rascal has become an inimitable pest attacking apples, vandalizing vegetables, sullying soybeans, and raiding residences. Since its discovery near Allentown, PA in the middle 1990’s, it has caused millions of dollars of damage to a wide variety of crops and delivered untold distress to millions of homeowners in more than 40 states by invading dwellings. Mischief caused by this exotic invader from Asia has been the topic of several previous episodes of Bug of the Week. For those of you who have had enough of this smelly arthropod, relief may be at hand. Over the next several weeks, we will visit several insects that know how to give stink bugs the ultimate comeuppance. Perhaps the knowledge that some beneficial bugs are undoing the stink bug will provide a modicum of solace. 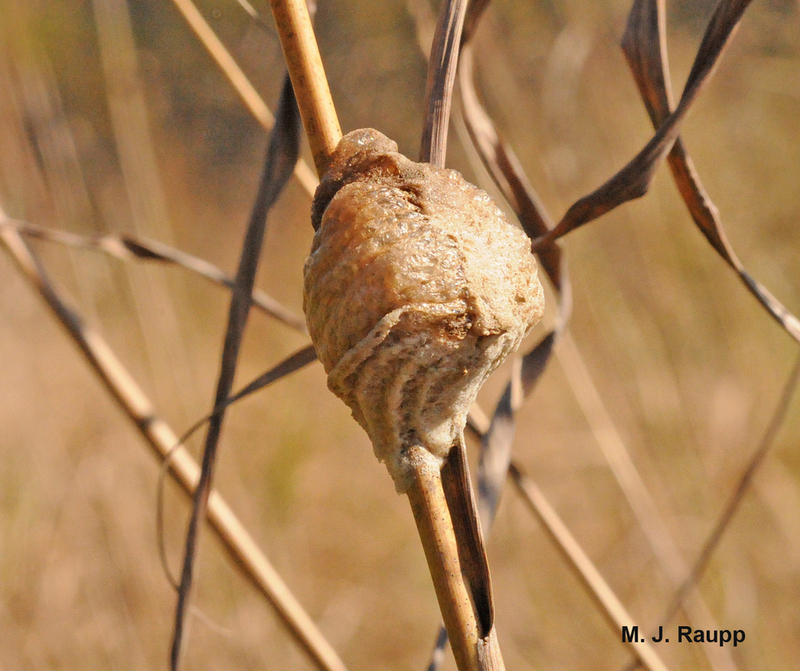 Stink bug protein is turned into mantis eggs inside an ootheca that endures winter's chill. We now travel back in time more than a century to October 16, 1897 when a Mr. Joseph Hindermyer discovered a large insect “resting on the upper part of his tomato vines” in Mt. Airy, a suburb of Philadelphia. Fortunately, Philip Laurent, Hindermyer’s neighbor and a member of The Academy of Natural Sciences in Philadelphia recognized this large insect to be a rather extraordinary mantis and later discovered that it was an exotic species known from China and Japan. How it arrived in Mt. Airy remains forever shrouded in mystery, but Laurent noted that a large nursery, Meehan and Sons, in nearby Germantown had procured many plants from China and Japan. Could it be that this marvelous predator arrived as a stowaway, perhaps as an embryo in an egg case on a Japanese maple? In the intervening century the Chinese mantis has enjoyed many delectable treats in its new home, ranging from unfortunate mates to hummingbirds. This well-known sit and wait predator is kin to other mantises we met in previous episodes of Bug of the Week like the European praying mantis (December 20, 2010) and the Carolina mantis (January 25, 2010). Like our native Carolina mantis, the Chinese mantis endures winter as an egg along with more than 100 brothers and sisters in a brown Styrofoam-like structure called an ootheca. In autumn, a female mantis deposits one or more oothecae usually on upright vegetation such as twigs of trees or stems of meadow plants. With the return of warm weather and small insects in spring, tiny mantises hatch and emerge from the egg case to search for prey. Yum! Stink bugs are good to the last bite! September is the month that I usually begin to see adult Chinese mantises in my landscape and last week I was rewarded with the discovery of a beautiful female on my butterfly bush, which has turned into a nursery and haven for stink bugs. Prompted by this discovery, I decided that it was time to have a reunion between these two historical “friends” from the east – the Chinese praying mantis and the Asian brown marmorated stink bug. Like many reunions I have attended, meeting old acquaintances can be fraught with joy and despair. In the case of the Chinese mantis, reuniting with the brown marmorated stink bug was full of gastronomic joy. She consumed a dozen stink bugs in quick succession before nibbling only half of unlucky stink bug thirteen. As for the stink bugs, well, let’s just say their reunion was filled with short-lived despair as our hungry darling mercifully devoured the stink bugs head first. 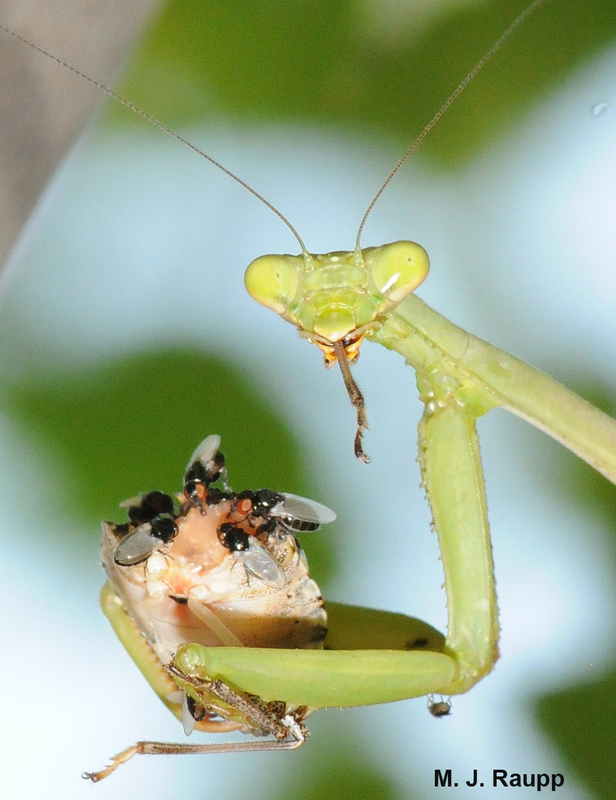 The European praying mantis also enjoys a good meal of stink bug. Scientists have discovered that well fed Chinese mantises grow larger and produce more young than those with limited food. Judging by the gusto with which this mantis consumed stink bugs, perhaps the stink bug invasion will provide a bountiful, dependable food source for this beneficial insect from Asia. This tantalizing email I received from a farmer in Maryland indicates that this might indeed be the case: “I don't know if this is important or not to you. Here on my farm I have seen an explosion in the number of Praying Mantis. Thousands of them, is there a relation to this and the population of stink bugs?” Let’s hope the reunion of this magnificent predator with its historical prey will help to quash our stink bug misery. We thank Harwood Owings who provided the inspiration for this episode. Two delightful articles “A species of Orthoptera” by P. Laurent, and “Ecological Consequences of Food Limitation for Adult Mantids (Tenodera ardifolia sinensis Saussure) by R. M. Eisenberg, L. E. Hurd and J. A. Bartley were used to prepare this episode. Support for our research on BMSB comes from USDA-NIFA SCRI Award #2011-51181-30937.